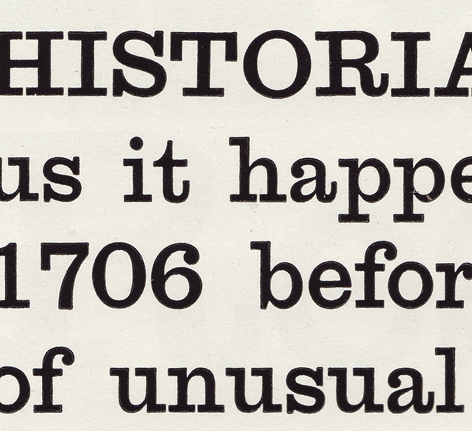 Sentinel Fonts: History | Hoefler & Co.
Slab serifs, now two centuries old, were chaotic from the start. Opinions differ as to whether the style was an import from signwriting to typography or vice versa, but by the second decade of the nineteenth century there were both painted and printed slab serifs throughout metropolitan London. The poet Robert Southey first recorded the word “Egyptian” in connection with the style in 1807 (Napoleon had returned from Egypt in 1799, sparking a wave of Egyptomania throughout Europe), and by the following decade all of the major British foundries had produced slab serif typefaces under different names that evoked the ancient world. 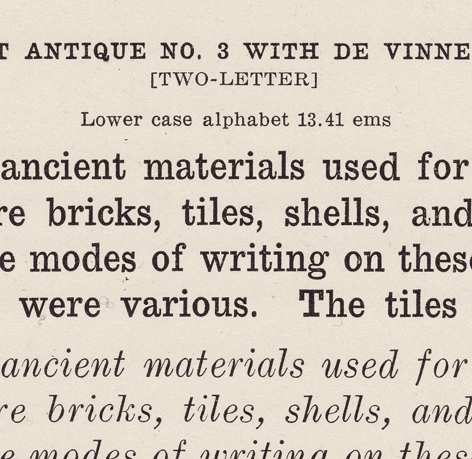 “Egyptian” survives as a term for slab serifs, along with “Ionic” (now chiefly associated with bracketed faces of the Century model); “Doric” was popular as well. But the very first slab serif printing type, made in 1815 by the master British typefounder Vincent Figgins, went by the name Antique. In the earliest slab serifs, there’s little to suggest much forethought on the part of their designers. 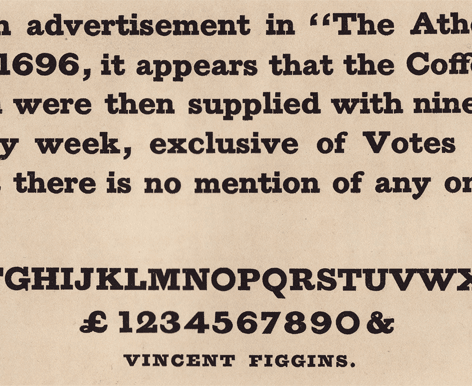 The typeface above, Figgins’ Two Lines Pica Antique No. 2 from his specimen book of 1838, gives the impression that its designer simply began with one letter and worked his way through the alphabet until the project was complete, never stopping to articulate the design’s policies or anticipate any problems. In many ways, this design is two typefaces, its uppercase and lowercase being almost wholly unrelated. The qualities of its steadfastly geometric O recur in the Q, but stop there: the other capitals exhibit a more modulated weight, from the N that differentiates thick stems and thin hairlines, to the S that continuously changes its thickness throughout the entire form. These characters may feel like exceptions that compromise the underlying rule, but in fact they set out a more sophisticated approach, one that would ultimately prove more fruitful than the rigid pursuit of mathematical consistency. All of Figgins’ earliest slab serifs exhibit this conflict between rationalism and practicality: here is another typeface from the same specimen book, the Minion Large. Whatever monoline aspirations this design might have had, it couldn’t sustain them in the lowercase, its geometric capital C forced to accompany a lowercase a which admits thick and thin strokes out of necessity. It’s a problem that worsens as a typeface gets smaller: at text sizes, such as this 7pt sample, letterforms demand open counters and clear gestures, two requirements that are incompatible with uncompromising geometry. Figgins’ successors in business would ultimately retain the name “Antique” to describe these kinds of moderate contrast typefaces, where the approach that allowed for a practical lowercase would ultimately be applied to the capital letters as well. The Antique style would come to include some marvelous typefaces, and the style would reach full maturity by the end of the century: above is the Double Pica Antique No. 2 that appeared in the 1905 specimen book of the V. & J. Figgins foundry. It’s an attractive design that scales well, easily adapted to both text and display sizes. And though it predates the modern notion of the coherent type family, it’s certainly a form of letter that can sustain a range of weights, as Sentinel hopes to demonstrate. A renewed interest in monoline slab serifs arose in the early twentieth century, as a natural extension of the rationalist ideas of the Bauhaus school. Paul Renner’s sans serif masterpiece Futura (1927) was followed by a spate of slab serifs that evoked the same Modernist ideals: Rudolph Wolf created the monoline slab serif Memphis for the Stempel foundry in 1929, M. F. Benton produced Stymie for ATF in 1931 (shown above), and Monotype introduced Rockwell in 1933. 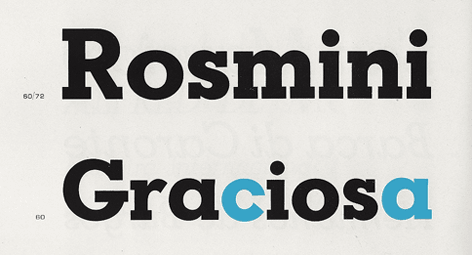 Geometrics remain a popular genre: our Archer typeface, published in 2008, is a geometric. All geometrics face the challenge of how to adapt to extreme weights, the same difficulty first encountered by Figgins in 1815. Those typefaces that do venture into Black and Ultra territory do so by significantly altering their designs, typically by reintroducing contrast once the weight of the font requires it. (The result of this approach is inevitably a disjointed type family, in which the heaviest styles feel unrelated to their lighter cousins.) An alternate solution is to simplify the letters themselves, an approach which which yields mixed results: above is the Landi typeface (1938) from Nebiolo, one of the world’s most competent foundries. Its lowercase a substitutes a one-storey construction out of necessity, but omits a flag serif on top; its lowercase c has no finishing strokes at all, a choice that qualifies this and many of Landi’s letters as full-fledged sans serifs. Regardless of the success of this solution, it does little to address the underlying weight quandary: this typeface, Landi’s boldest weight, is not especially bold. A beloved variation on the Antique is the Clarendon, which adds bracketed serifs that gave it the illusion of additional weight. Though technically a nineteenth century innovation — Figgins included brackets on a set of capitals in 1833, Caslon followed with a bracketed lowercase in 1844, and Benjamin Fox produced the first face called “Clarendon” for the foundry of Thorowgood and Besley in 1845 — some of the best and most significant Clarendons are twentieth century designs. 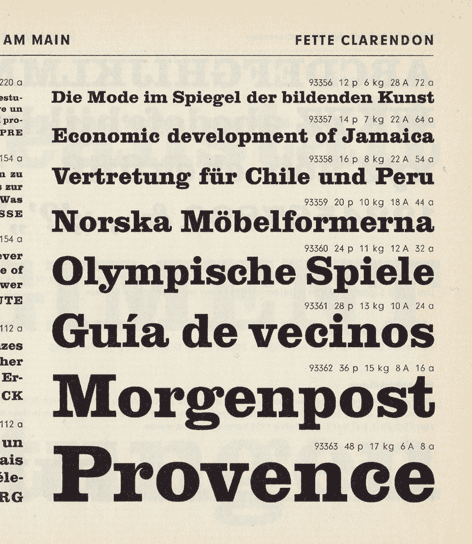 This typeface, Hermann Eidenbenz’s eponymous Clarendon produced for the Stempel foundry in 1951, has become a classic that for many people is the epitome of the Clarendon style. It was popularized by a generation of mid-century American designers, Bradbury Thompson and Lou Dorfsman foremost among them, and it remains a useful and well-liked typeface. But like its nineteenth century forbears, it’s impaired by the lack of an italic: a pardonable folly in a Victorian typeface, but unforgivably negligent in a modern one. Many twentieth century type foundries produced at least one Clarendon, though most were content to keep with tradition and ignore italics altogether. A few enterprising designers tried their hands at synthesizing a plausible Clarendon Italic, but none was an unqualified success. Above, one of the most awkward candidates, the Egizio Corsiva Nero (1958) uncharacteristically produced by the otherwise capable Nebiolo foundry, under the direction of the legendary Aldo Novarese. Its admixture of cursive and static forms creates an odd chimera, unwieldy at small sizes, and perplexing at large ones. But Clarendon’s ultimate limitation was not its missing italic, but its lack of a ‘book’ weight for text. The heavy bracketing that characterizes the style, both useful and attractive in heavier weights, becomes a burden as strokes become thinner, restricting how light the typeface can go. At large sizes this relentless motif overpowers the weight of the letters themselves, and at small sizes it interferes with the crisp outlines and open counters that a text face demands. The few Clarendons that succeed in a lighter weight are display faces, such as this one: this is Clarion Wide No. 2 from the Photolettering collection, a colorful period piece lovely for display settings, but simply impractical for text. Though the Antique style escapes the Clarendon’s difficulties in adapting to different weights, it too was hobbled by the lack of a sound italic. A tantalizing glimpse of an idea not fully explored can be seen here, in the Linotype specimen book of 1905: their upright Antique No. 3 accompanies an unrelated italic, the skeletal DeVinne Italic. These two typefaces were ‘duplexed,’ a technique that included both fonts on the same set of matrices, allowing machine operators to switch from one font to the other at will. A modern type designer working in the digital environment might think to beef up this italic, in order to create a more robust design that could stand up to the stalwart roman with which it was paired. But limitations of the technology at the time made this impossible: duplexed typefaces such as these had to share the same set of character widths across both fonts, forcing naturally wide romans and naturally narrow italics into an uncomfortable compromise. This italic, were it to be emboldened, would have to gain its weight on the inside, which would push complex letters like the lowercase m well past the point of legibility. Unbound by traditions that deny italics, by technologies that limit its design, or by ornamental details that restrict its range of weights, Sentinel is a fresh take on this useful and lovely style, offering for the first time a complete family that’s serviceable for both text and display. From the Antique style it borrows a program of contrasting thicks and thins, but trades that style’s frumpier mannerisms for more attractive contemporary details. It improves on both Clarendons and Geometrics by including a complete range of styles, six weights from Light to Black that are consistent in both style and quality. Planned from the outset to flourish in small sizes as well as large, Sentinel contains features like short-ranging figures that make it a dependable choice for text. 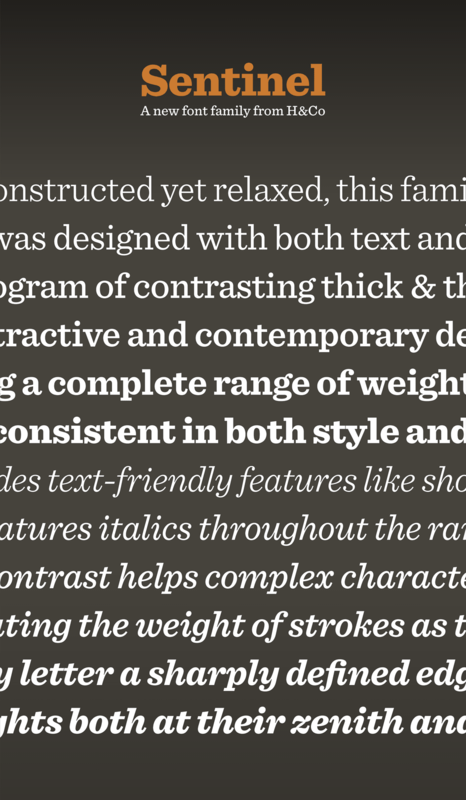 And most mercifully, it includes thoughtfully designed italics across its entire range of weights.